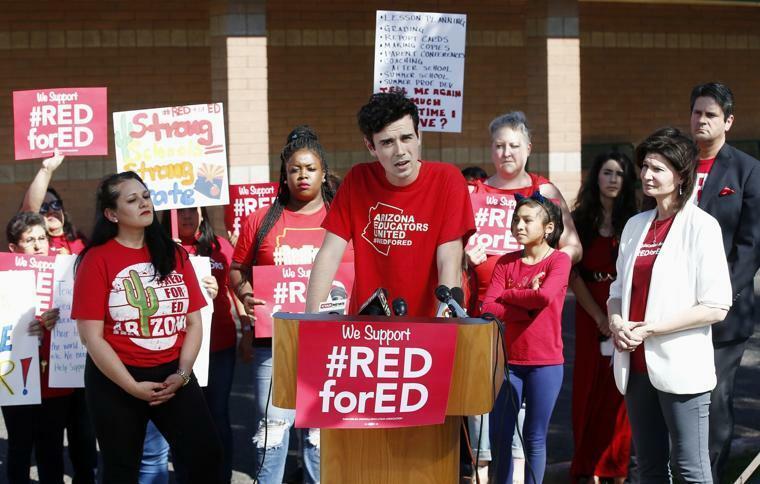 Music teacher Noah Karvelis, center, who helped organize Arizona Educators United, speaks at a news conference Wednesday. 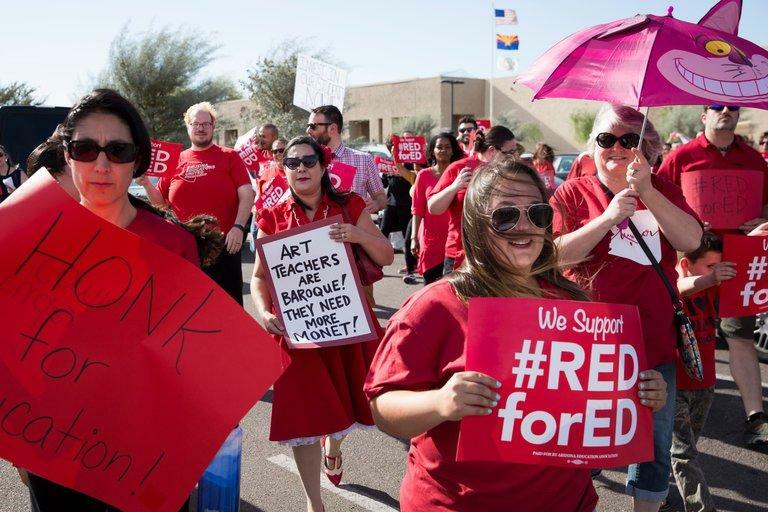 Around 30,000 to 50,000 teachers and their supporters are expected to march through Phoenix to rally at the Arizona state Capitol to demand a 20 percent raise for teachers, about $1 billion to return school funding to pre-Great Recession levels and increased pay for support staff, among other things. In Colorado, more than 10,000 teachers are expected to demonstrate in Denver as part of a burgeoning teacher uprising. About half of the student population will have shuttered schools as a result, with teachers using personal leave time to take off. The walkouts are the climax of an uprising that began weeks ago with the grass-roots #RedforEd movement that spread from West Virginia, Oklahoma and Kentucky. Colorado lawmakers from both parties have agreed to give schools their largest budget increase since the Great Recession. But teachers say that the state has a long way to go to make up for ground lost during the recession and before that due to the state's strict tax and spending limits. Arizona Education Association president Joe Thomas said that tomorrow's march to the Capitol is necessary after attempts at outreach have been ignored. There's no end date for the walkout and he said educators may have to consider a ballot initiative for education funding if lawmakers do not come up with a plan on their own. "How it ends is up to the governor and up to those legislative leaders," Thomas said. "If they're courageous, if they have the political capital to come down and speak with us, we all get a win." Republican Gov. 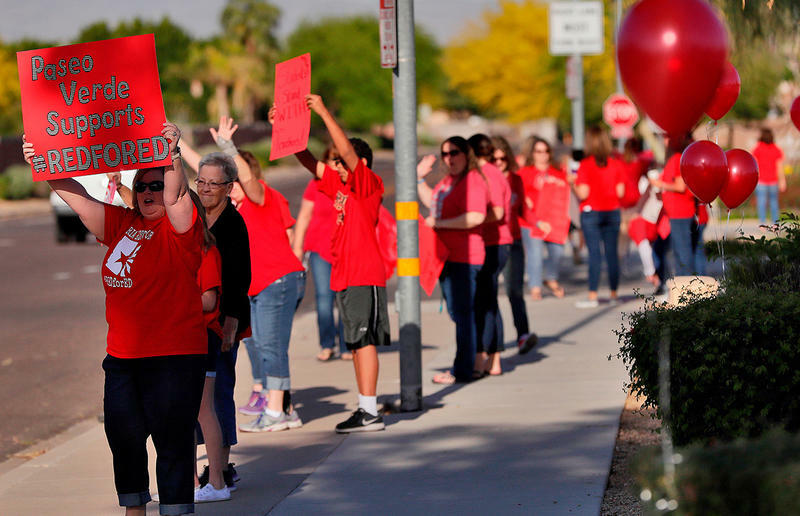 Doug Ducey has laid out a plan for a 20 percent teacher pay raise by 2020, but organizers of the so-called #RedforEd movement say his plan relies on rosy revenue projections and doesn't address the other issues. Districts around the state have said they will close as a result of the walkout. More than 840,000 Arizona students are expected to be out of school on Thursday, according to an analysis from the Arizona Republic that tallied up at least 100 school districts and charter schools are closing. The state Department of Education said the state has more than 200 districts and more than 1.1 million school children. 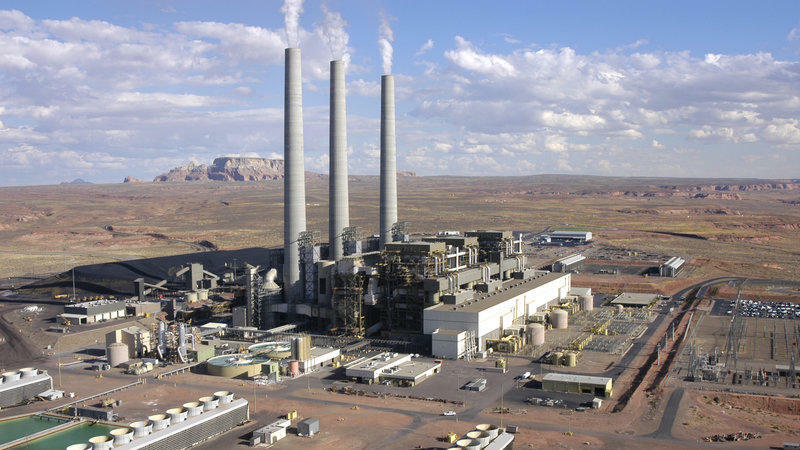 The Arizona Senate has joined the House in approving legislation exempting coal used in a power plant on the Navajo Nation from the state's sales tax as a way to help make it more attractive for a new buyer. 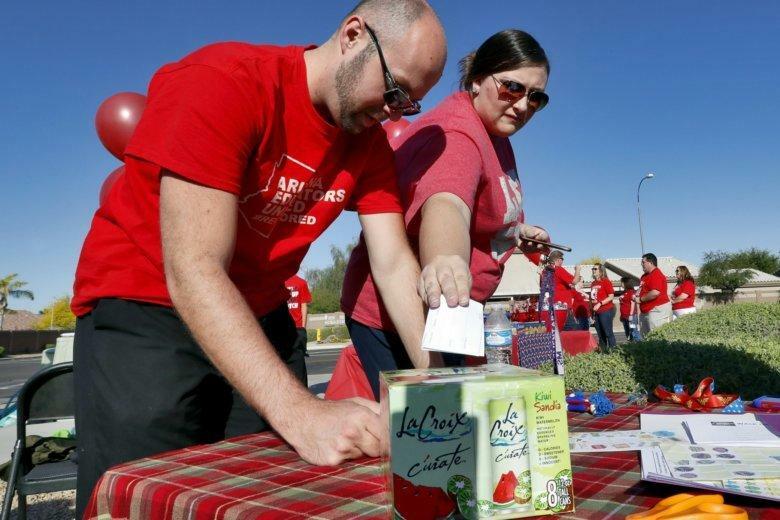 Arizona teachers have voted to walk off the job to demand increased school funding, marking a key step toward a first-ever statewide strike that builds on a movement for higher pay in other Republican-dominant states. 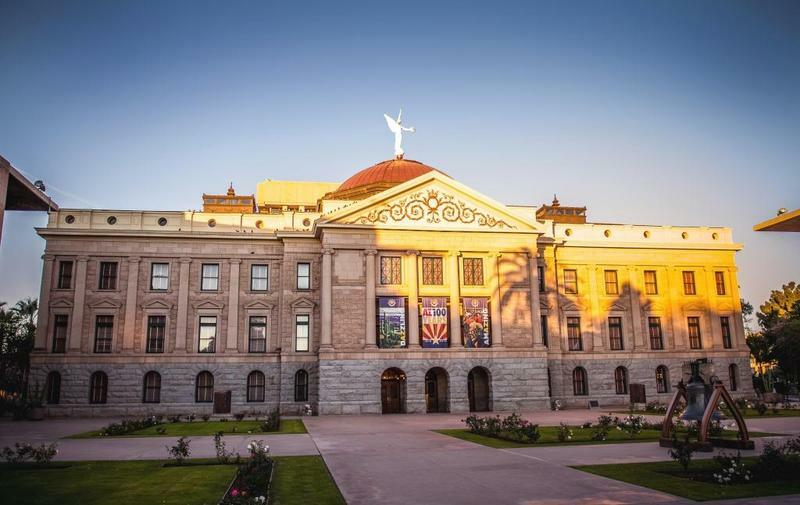 The Arizona Legislature on Wednesday gave final approval to a proposal allowing victims of sexual misconduct to talk to police or testify in a criminal case even if they signed a non-disclosure agreement as part of a civil settlement.